AAVSO Alert Notice 655 announces an observing campaign on the bright multiple, eclipsing system b Per. Please see the notice for details and photometry and spectroscopy observing instructions. I accidentally omitted from Alert Notice 655 the date and time on which the predicted eclipse window is centered. I have added this information to the webpage version of the notice and sent a revised version by email to subscribers. In Alert Notice 655, the position given for the check star (HIP 20370) was incorrect. The correct position is R.A. 04 21 45.47 Dec. +50 02 06.64. The Alert Notice text has been corrected. Thanks to Shawn Dvorak for reporting this mis-position, and our apologies for any inconvenience. Hello. I'm a sporadic binocular observer. I noticed that there have been almost no visual observations of b Persei. Would visual observations be helpful at all? It's so rare that a precipitous campaign pops up for something in my available range. I understand that this eclipse should resemble the one of December 2016, see figure 4 in https://www.aavso.org/aavso-alert-notice-655 . You can judge for yourself whether you would be able to confidently detect the eclipse (and I guess there won't be many other visual observers for averaging observations across observers). So I'm a bit sceptical whether this is a good target for visual observing. But it could be a great project to start DSLR observing, if you wnt to consider something new. James, All observations are certainly welcome! Certainly, if the visual observations compliment CCD and DSLR observations when only one other observer reports. We expect 0.2 to 0.3 magnitude dips for this event. I believe that most contributers to the previous campaigns observe with DSLR's and modest focal lengths in order to get a large FOV. You also do not need a clock drive, but would have to be at the camera a good fraction of the night beginning about 8:30 pm local standard time when the star is high enough. Thank you, Don and HBE for your replies. I feel like I did fairly well with my visual observations, considering the limitations of my equipment, the somewhat cooperative weather, and the requirements of life with two toddlers. I could definitely see a dip of ~0.2 mag moving right along with the photometric observations of the other observers. While this was fun, it has definitely inspired me to get a little more sophisticated with my observing. So I have taken the leap to pick up an inexpensive used DSLR and begin to figure out how to do more of what you guys were doing. Hopefully I will be able to contribute more to the next bright star photometric campaign that comes up. Thanks again for the interesting project! I read with interest the article that was touted in the Alert Notice, but am a bit skeptical about the advice to use ISO 100 with a 15 second exposure. Measurements with my camera indicate that ISO 100 is barely within the linear dynamic range regime, and because of that, I generally use ISO 200 or 400. I realize the situation might be different for other cameras. Certainly, a 15 second exposure at ISO 200 will put my system deep into saturation, and so I am going to try using a neutral density filter in front of my (71 mm aperture) telescope. I do not know whether anyone has done this before, or has any ideas. If so, I would certainly like to hear them. My plan is to do a test tonight if it clears up, or if not, next clear evening. Stephen, If the ND filter over the objective to the telescope doesn't solve your problem, you can alternatively try stopping down the aperture. I've been using an 80 mm aperture on a CCD with a V filter, stopping down the aperture from 80 mm to 30 mm using black paper fitted over the lens bezel with reasonable results. I still reach close to saturation at 15 sec, so I need to average about 9 frames (after extracting the photometry) for each reported observation. If the co-adding is inconvenient, I can apply the co-adding on your downloaded data from AAVSO. I had tried a 10% ND "lunar filter" on my CCD camera last year (in addition to the V filter for the CCD). The results were encouraging, but one night they were very sporatic. I suspect the quality of the filter - meant for eyepiece viewing of the Moon. I imagine a full aperture ND filter over the aperture of the telescope will be superior to a poor quality filter near the detector. Defects at the objective will be completely de-focused across the whole image. De-focusing is also helpful, if de-focusing is not extreme. Please share the results of your full-aperture ND filter with us! I assume you are trying de-focusing your images. I agree that 15 seconds exposures will make it hard to avoid saturation. a) Actually you will want 15+ seconds integration time , or total exposure time, per datapoint, to avoid your reported datapoints from being contaminated by athmospheric effects. Whether you collect those 15+ seconds worth of photons by using one long exposure, by stacking a number of shorter exposures or simply by averaging over several measurements is not really important. b) Instead of using a DSLR on a small telescope, consider using a telephoto lens. If you want to do ensemble photometry, you'll need a wide field of view anyway to get more comparison stars in your field. E.g. this time I'm planning to use a small (vintage) 85mm F2.0 lens on my Canon EOS 1100D, which gives the field shown below (shown with the AAVSO FOV=7.5° finder chart overlay). Seems just about right in terms of field of view, and even with this tiny aperture I don't dare to use more than 2.5 seconds exposure per image (ISO 200). I plan to combine perhaps some 10 ... 25 images per datapoint, will do some more testing, weather permitting) . This should get the statistical error below 0.01mag, as requested. As planned, I attempted to do photometry on b Per by placing an ND4 filter over the objective of my scope, and collecting a series of 15 second exposures at ISO 400. (It would have been better to use an ND2 filter at ISO 200, but I don't have one.) Images collected for the preceding target showed maximum SNR with aperture set to 8/15/25 in the green, but for this star I needed to increase the outer aperture to an absurd degree - doubling it! With an aperture setting of 10/30/50 I was able to get a reasonably well behaved SNR plot; the profile showed a peak of around 5500 ADU and a slow exponential decay. I am at a loss as to how to explain this; the filter should have no defocusing effect, but somehow it did. In answer to the obvious question, yes, I checked the focus setting on the telescope, and no, it did not change. So much for that short cut! I cannot quite figure this...this is a filter that covers the aperture of the telescope, not a screw-in filter at the eyepiece/camera end? Could dew be a problem here? After posting, I arrived at the very same idea. The dew was truly awful last night, and I am thinking the objective had a fat layer of dew on it. When I put the filter in place; the water filled the space and thus effectively changed the shape of the lens. Here is a dew shield I had made a number of years ago for small lenses. 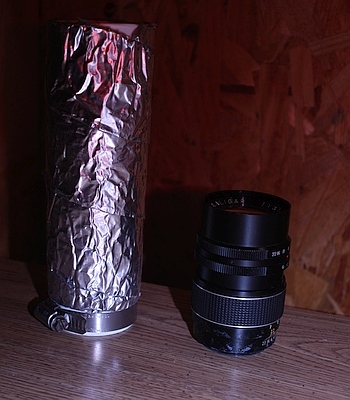 The tube is some aluminum flashing wrapped in a cylinder and clamped to the 135 mm FL lens shown. The Al cylinder is wrapped with insulating sticky tape to wrap heating and air-cond ducts. The tape came in a 2 inch roll from a Home Depot, I believe. The lens from a used photography shop and wcrewed (T-thread) into the ST7 CCD camera. It also helps to occasionally use a hair dryer. I don't use this anymore, but the quality of the data were about the same as the stopped down 80 mm telescope with a 400 mm focal length. See attached photo. Good Observing! No chance to use the 135mm on your DSLR? Last night I tried again. No dew whatsoever. Fifteen minutes before doing the series on b Per, I did one on RU Peg. Processing today indicated (AIP4WIN) apertures for maximizing SNR for RU Peg were 9/15/25 in both channels. With b Per, the B channel maximized SNR for an aperture of 13/18/25 (!) and the G channel maximized SNR with an aperture of 10/15/25. So, there is some sort of defocusing effect in the blue. But moreover, I found that lambda Per saturated in the green, which it should not do. I cannot explain the defocusing effect but it is clear to me that ND4 may provide "about" two f/ stops of absorption for photographic purposes, but not for photometric purposes. At least, for the above average quality commercial photographic filter I was using. As far as I am concerned, my b Per experiment is at an end. If anyone wants to see any of the images, let me know relatively soon. For using the DSLR for bright stars such as b Per I had used a Canon stock lens zoomed to 135 mm or 100 mm focal length. I don't use a DSLR anymore as opposed to CCD for b Per because the loading of the images into a photometry program (Maxim DL 6.11) take incredibly long. . However, I encourage observers to continue using their DSLR's for b Per to continue to get the excellent results. I would like to know how observers get around the download problem. I have concluded that reducing the aperture to 30 mm on a 400 mm FL telescope is a problem. The problems occur because this reduces the aperture from f/5 to about f/8. The dust specks on the objective are much more noticeable than at the f/5 (full 80 mm aperture) or f/7 (43mm aperture) and harder to flat-field out. I plan to use the configuration for the last 4 eclipses (43 mm aperture) that gave good results. I plan to try a 3-stop and 4-stop objective filter film - but not until after this eclipse which begins this Saturday or Sunday! Defects in the filter and objective will be way out of focus at full 80 mm aperture. > but not until after this eclipse which begins this Saturday or Sunday! I wonder, is this based on the older period estimate of ca 702 days (Hill 1976)? The latest estimate, also based on our AAVSO observations, is more like 704.9 days (see the alert notice). From the lightcurve of the Dec 2016 event, I would think that the eclipse back then must have started near JD 2457738 +/- 0.25 d . If you add 704.9 days, I get Tuesday, 2018 Nov 20 09:36:00 UT . The Jan 2015 campaign actually spotted the beginning of the eclipse pretty well near 2457033.5 , if you add two periods you get to 2458443.3 or Tuesday, 2018 Nov 20 19:12:00 UT. I'm not saying that people shouldn't start observing already on the weekend, but I guess one should not bet on the eclipse starting then. Or am I missing something? The beginning of the eclipse will be highly dependent on the angle of the A-B stars in the sky as the C-star crosses behind the orbiting pair. The start of eclipse could be between 1 - 2 days before the predicted mid-eclipse. I have worked on simulating the eclipses, but am hesitant to share those because I want to verify that I have a reasonable solution, so our uncertainty in the eclipse start is still rather high. After we observe this fifth high time resolved eclipse I plan to return to work on the simulations and plan to share progress on this forum and plan to present our results to the spring 2019 AAVSO meeting in Toronto. So - please begin observing in ernest as soon as possible to get the good "base-line". This week has been terrible weather in Eastern USA. Ah I see.. silly me didn't realise that the period estimation is actually comming from you when I replied :-) . Weather isn't so good here in Germany as well, but the forecast is a bit optimistic for the weekend. I'm trying to take test frames this night. I have worked this past summer on simulating the light curves for the b Persei events - including a prediction for the upcoming light curve as the third star is predicted to pass behind the close-orbiting A-B stars. The prediction is far from certain. It requires many geometric parameters: stellar sizes; separations; line of nodes axis (the intersection of the AB orbital plane with the Earths celestial sky at b Persei); date of mid eclipse (when the third star passes the center of mass of the AB pair); the "impact" parameter (the closest distance of the C star celestial path to the AB center of mass); and more. Maximum ellipsoidal light appears when the A-B stars' orbit crosses the line of nodes (when the stars present their widest cross-section to the Earth direction). The three stars' luminosities in the simulation are simple luminous disks with the stellar relative luminosity spread uniformly over the area of each respective disk. There is no limb-darkening nor ellipsoidal stellar distortion taken into account. Some of these parameters are displayed on the attached picture of the light curve. The parameters are based on a relatively good fit to the four AAVSO light curves (only as far as timing and general shapes of the dips) based on what we know about the astrophysical nature of the three stars (spectral class, luminosity), which are relatively unknown for the B and C stars. I've worked mostly with the timings, the angles, and the impact parameter. I have not tried to fine-tune the relative luminosities and stellar radii. The mid-point of the predicted eclipse ~JD 2458444.0 is around noon UT (Nov. 21.5 UT) The N. American observers have the best opportunity to observe the expected first dip at ~1442.75 (before dawn on Tuesday, Nov. 20) - if my time calculations are correct. Let me emphasize that photometry for extended times are requested for all weather-permitting nights from now for the next two weeks in order to get a good "base-line" for the out-of-eclipse light curve as well as possibilities that the prediction of first contact is off by a day. The largest uncertainty in the simulations is the determination of which star (A or B) is interacting with the C star for each dip in brightness. After this eclipse I plan to "play" with the parameters and look for plausable alternate solutions which would give the "best" fit to the 5 observed light curves. Let me know if observers would like to see my simulations for the 4 previous high time-resolved b Per events. the instrumentation (ED scope, V-filter and CCD) is fine ready but the forecast for Spain is desperately bad for the next 7-10 days. But I will keep in alert if there is a change in forecast. I use a 280 mm focal photolens at F/4, the EOS M3, Iso 100, 15 sec exposure at low elevation, down to 13 sec when approaching the zenith. Defocus is 11 Bayer cells wide taking the advantage of the good shape of the "Bokeh" of such photolens. SNR above 1000 per image, series of 20 images, each image processed and series averaged. The comp is 55 and the check 74, I use another ensemble of stars to check the sky condition and the large air-mass variation of this particular observation. 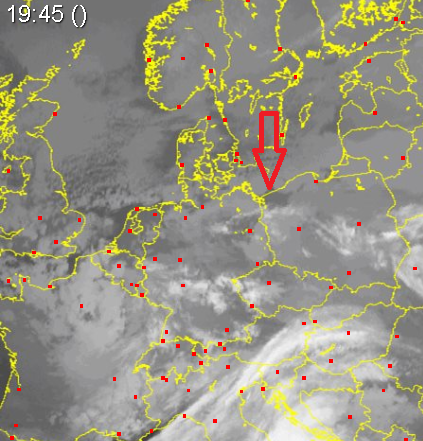 In theory we have a nice string of observers (Poland, Germany, France), let's see what the weather allows. It is almost 6:00 am tues AM EST (11:00 UT Nov 20). Having gone to bed last night amidst heavy clouds, b Persei comes in at magnitude 4.8 V. Last night I got some images briefly before the rain closed me down. b Per at 4.7 V. Looks like we had first contact. Looking for any confirmations! I had to give up, there weren't even cloud gaps where I live. However I managed to get a few frames that seem usable perhaps from iTelescope in New Mexico , around midnight local time, at most I'll get a single datpoint from it. I'll do the reduction at home this evening. Yesterday I discovered on sat24 a 100km hole in clouds moving west. I managed to get only 6 valuable RAWs (each exposured 30 sec) because it didn't pass centrally through my location. I got only 1 point on LC (19,19 UT 19th of Nov). Tonight I will hunt for more pieces of clear sky. I should be ready for observations starting from about 18UT. I made some rough "graphical" comparison between current AAVSO LC of b Per and Don's ephemeris. I have some serious problems:(. The check star magnitude for last night's data and this morning's data has suddenly changed from the previous series of observations. Thus the "First Contact" shout that I gave this morning is pre-mature. I can't find what is doing this, but I am working on it. I'm investigating other check stars in my rather small fov to see if they are any more consistent. Everyone please keep up the good work in finding stars on these cloudy nights!!. Congratulations to Gerald Persha for getting a nice light curve of the first contact as b Per C enters eclipse behind the A-B pair! As mentioned earlier, I have some problems with my results from last night (a few points ahead of Gerald's), which I am frantically working on to figure out. Had clear skies here in Little Rock. As of 1200a CST, I still had b Per at 4.6 mag, using the 43, 45, and 50 check stars on chart X23456ATG. Should be clear tonight as well, I'll try and get more observations (my almost-3-year-old had a bad dream last night I had to help take care of -- not just clouds can interfere with astronomy!). It's raining over here :-( Worst b Per campaign weather ever.... sorry . I hope we have some clearing in Europe tonight. I realize the night has already started for Europe. Anyhow, after the eclipse is done (very soon now) please get a time run of the out-of-eclipse data. These are just as important as eclipse data so we can pin down the ending as well as the start of eclipses. We also need everyone's out-of-eclipse data so we can calibrate the offsets from artifacts of different optical systems. Go away, clouds!! Let the stars shine forth! > Any clear skies tonight? Not where I live :-( . Sorry!! Same here in Dijon/France, we are in thick haze, no observation possible on last four nights. In my place (Szczecin, Poland) the last 2 nights were completely cloudy. But I had quite successful observational session of b Per on 20th of Nov between 18-2 UT (JD ~ ...443,25 - ...443,60). I have taken ~600 RAWs, each exposured 30 secs. Images are not overexposured (I've checked), some are fuzzy (it was windy), RAWs from initial two hours were taken between clouds. I will reduce the data during the weekend. Many, many thanks for the observers who braved the wintry weather, looked for cloud gaps to shoot through, we received some good light curves of the b Persei secondary eclipse. I had "stuck my neck out" predicting the center time of the eclipse and the observations back me up! Thanks again. There are still some problems with the photometry of this eclipse. I have looked at several of bPer's neighboring stars for variation. They all showed a significant increase in brightness during the eclipse happening. Most of those bright neighborhood stars are confirmed to be variable. Because they all brightened during the eclipse, that means the comp star (55 in the star charts = HIP20156= 5.456V) maybe is variable - perhaps a massive flare??. It has proved to be stable for the last eclipses. I am in the process of repeating photometry of several nights during the eclipse using one of the other neighborhood stars as the "standard" to see what happens. I will keep you posted. These check stars returned to normal after the eclipse and I believe were normal before the eclipse. For those of you who took images with CCD or DSLR the past week(s) of b Per, I would appreciate photometry using several of these check stars. I am hampered by a rather narrow FOV (2 x 1.7 deg). The next eclipse - adding 704.85 d for the C star period to the date of the Feb. 2018 secondary eclipse gives JD 24588679.95 = Jan 19, 2020 at 10:48 UT. For those who contributed to the eclipse data, and before the eclipse began, please get a couple of hour's run on bPer as soon as possible. Thank you. I have finished processing the observations V data for the November 2018 eclipse of b Persei where the C star passed behind the close orbiting AB pair. Thanks to all who attempted to obtain data through the pesky clouds that prevented any more than one observer to view during the eclipse, so the data suffers a bit. We also had some problems with my optical system during the eclipse where the check stars – yes I went back and tried several other stars in the field of view to see if other stars had the irregularity. They did. I conclude that the problem was a partial obscuration in the optics (partial dew, actual “bugs” make spider webs in the telescope - non found). So far the source of the problem has not been found, but I've been able to figure the rough corrections. 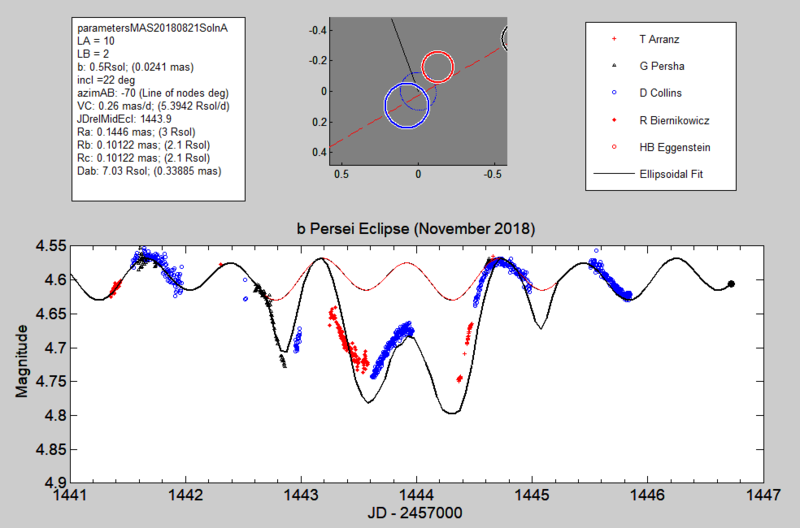 The other data was offset (if necessary) so all observers' data showed the same out-of-eclipse values which lie on the 2-harmonic light curve from the ellipsoidal variation of b Persei. I've attached the resulting light curve from this processing. The simulated light curve during the eclipse – showing the dips in magnitude – is the expected light curve that I had posted on the forum before the eclipse. I had run simulations for all four of the previous time-series eclipses that we have measured. There are many parameters to adjust in looking for solutions for all four eclipses. These are: luminosities of each star, sizes of each star, size of the AB orbit, the direction of the line of nodes between the Earth's equatoral plane and the AB orbit (this is the angle to the equator that the AB stars lie on during maximum elllipsoidal brightness). Also the “impact parameter”, which is the closest distance the C star approaches the center of mass of the AB pair, and the time that the C star passes the point closest to the CM of the AB pair. The strategy was to assume the luminosities based on what we know of the three stars' spectral classes (Hill, 1976). The speed of the C star's passing the AB pair is obtained from the interferometry measurements by Bob Zavala and Jason Sanborn. The only parameters that were “allowed” to vary in the search for a fit were the time of center eclipse, the impact parameter, and the angle of the line of nodes. After these unknowns are found for the “best” fit, I plan to look at the sizes and luminosities. When we can form those fits we will have a better idea of the nature of the B and C stars. The spectral class of the whole system is spec type A, which I assume is the A star. Hill only suggests that the spectral classes of the B and C stars are spectral type F.
The attached simulation, which was compiled late last summer, was based on a similar fit to the other four eclipses we've observed. The predicted simulation and the data indicate the very good agreement in the timing of the eclipse. Note that the onset of the eclipse observed by G. Persha in last month's data exactly agrees with the predicted time at day 1442.75. 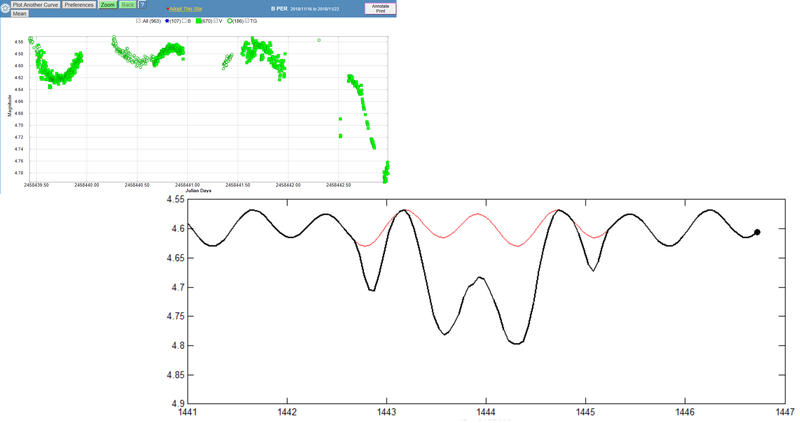 One may argue that we might have missed a small dip in light curve earlier in day 1442 – the Asian nights. Further trials with simulations will confirm whether or not we have the “best” solution. I plan to work more on these simulations during the winter and I hope to prevent our findings at the spring AAVSO meeting in 2019 in Toronto. I will shortly post animated simulations of all the eclipses based on the same parameters. These may not be the “best” fits of the parameters, however. The next eclipse - adding 704.85 d for the C star period to the date of the Feb. 2018 primary eclipse gives JD 24588679.95 = Jan 19, 2020 at 10:48 UT. Again, thank you for your participation. We all wish the weather had cooperated better in Europe. I have made available animated simulations that I have made for each of the b Persei time-series eclipses that we (AAVSO) have observed so far beginning with the February 2015 observations. We have made considerable progress in understanding the nature of the transits and the ephemeris of the transits. The third star's orbit has a 704.85 ± 0.05 day period around the AB pair. This period is significantly different from the period of Hill, et. al. (1976, Astrophysical Journal, 208, pp 152-164): (701.8 ± .4 day). Future observations should reveal whether the period drift is real. The 704.85 day cycle was observed from the times that the center of the C star passes the center of mass of the rapidly orbiting AB pair based on fitting the eclipse light curves to the possible simulations. where P is the period discussed above (704.85d) and E is the ephemeris integer. The simulations that I developed assume uniformly illuminated disks for each of the stars. 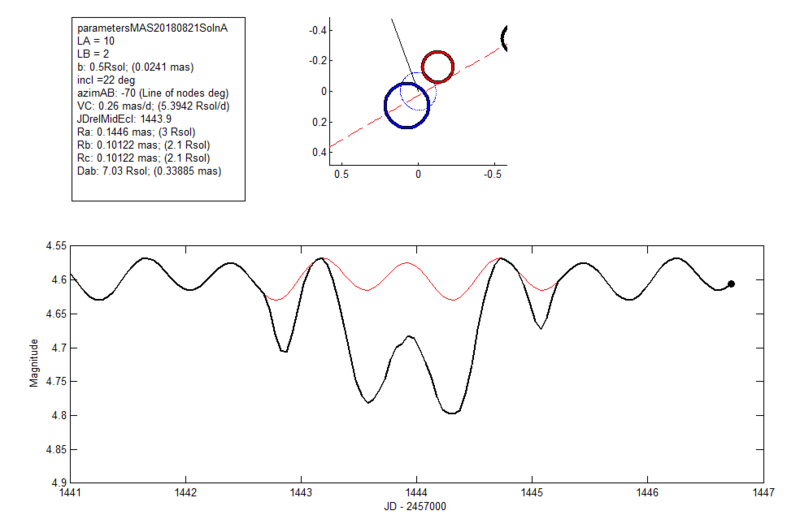 The radii of the AB stars are calculated by Jason Sanborn of Lowell Observatory using Binary Maker 3 code to solve for the ellipsoidal parameters for the out-of-eclipse light curves of b Persei. The C star radius is assumed the same as the A star (guess). The luminosities of the A, B, and C stars are assumed to be 10, 2, and 2 solar units based on average values for spectral class A2V for star A and assumed spectral class F2 for the B and C stars (Hill, 1976). These luminosity and size parameters were not adjusted in the simulations. 1): the “impact parameter” - the closest the C orbit passes to the center of mass of the AB pair in the sky – indicated by “b” on the simulations. 2): the azimuth angle of the the line of nodes of the inclined AB orbit on the Earth's equatorial sky. The AB pair exhibit maximum light in the ellipsoidal cycle when the AB axis lines up with the line of nodes – they present their largest broadside to the Earth. There are two maximum light times in each elipsoidal cycle of approximately equal brightness. This is indicated by azimAB on the simulations. 3): the velocity of the C star as it transits the AB pair. This used the observed velocity (in mas/d) from the NPOI interferometer results from Bob Zavala and Jason Sanborn and then adjusted to produce better fits to the photometry observations of the transits. (VC on the simulations). These values are different for the primary and secondary eclipses due to the eccentricity of the C-s orbit. 4): the time of mid-eclipse (JdrelMidEcl) when the simulation shows the C star to pass the closest approach to the center of mass of the AB pair. The resulting light curves are calculated from the un-obscured total light as the “disk” of the C star passes in front of the AB pair (primary eclipse) or behind the AB pair (secondary eclipse). Synchronized with the animated light curve is an animated drawing of the positions of the three stars during the transits. South is up in the drawing. The dotted line is the orbit of the C star as calculated by the NPOI. The units are milli arc secs. DIRECTIONS FOR DOWNLOADING AND VIEWING:The animations are attached as zipped files of still images or frames. To view each animation you should extract the individual images and view them sequentially with an image viewer. If your viewer steps forward or backward you can view the configuration of the three stars at each stage. I like the free program Irfanview to view the images sequentially (https://www.irfanview.com/). I've been using Irfanview for many years on my computers. It is small, fast, and efficient for viewing animated sequences. These simulations are preliminary versions. I will take a better look at the best angle of the line of nodes before going any further. I hope some of you will investigate invoking PHOEBE modeling software (Physics Of Eclipsing BinariEs). One of you has already shown an interest in it. PHOEBE is free and good at solving many parameters of eclipsing binary stars by fitting the simulated light curves to the observations in a programmed manner. It is open source and should be able be expanded to include triple star systems such as b Persei. I will soon post animations of the simulations that assume a 180 degree change from the results ahown in this post. This would interchange the order in which stars – A or B – are involved with the light curve dips at each dip. I would appreciate any suggestions or comments about these simulation results to be posted on this forum. We have a break from no transit events of b Persei in 2019. The next event happens in January 2020 – about a year from now.